Working on Fire is a government-sponsored organisation that trains men and woman (mostly from poor communities) how to fight bush fires, like those that threaten our green peninsula each summer. 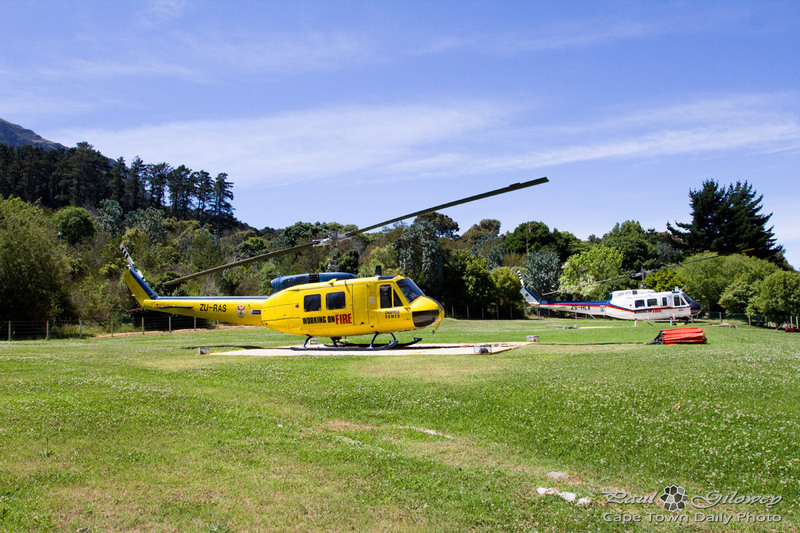 This base, at Newlands Forest, is one of over 200 bases (map) scattered across our country. Visit their website to find out how you can get involved. Posted in General and tagged fire, helicopters on Saturday, 1 December, 2012 by Paul. I would like to ask on behalf of a friend who recently moved to Cape Town form Canada as in how to go about finding possible work or further his training in the helicopter industry. I noticed you have an helicopter fire fighting program and would like to know more. My friend has some experience in helicopters and did some training on helicopters etc while he was staying in Canada where he did +- 100 hours flying time while doing the training. He is seeking any opportunity to further his career in becoming a pilot and therefore would like to know where to get more info and training in doing so. He has also been working on yachts previously and recently did a rope access course but he would really like to become a helicopter pilot to pursue his career. I would appreciate any assistance in this regard.